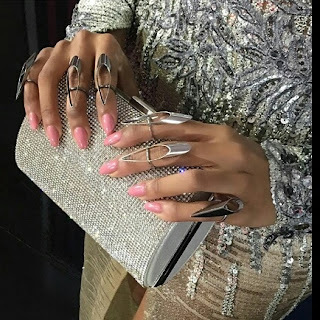 CHECHESMITHNATION : Bonang Matheba Stole The Show Wowing In This Metallic Number At The SAMA! Bonang Matheba Stole The Show Wowing In This Metallic Number At The SAMA! The queen herself , surely did not disappoint in this pretty sparkling long sleeves, metallic dress that featured deeply plunging neckline and a front slit. She paired her look with a strappy Giuseppe Zanotti gold heeled sandals and a cute silver purse. We love love this look.